Found one file extension association related to Photo Story and 1 file format developed specifically for use with Photo Story. 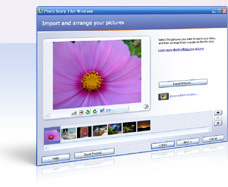 Photo Story is a freeware photo editing and management software from Microsoft. Photo Story includes features that gives users the means to create a slideshow with their digital pictures, edit their pictures, create story with original music, add narration, and share them with others. You can create a photo story that includes motion, narration, and music. Photo Story 3 includes dramatic pan and zoom effects, picture rotation, and cropping tools to customize your photos. You can also compose an original soundtrack from directly within Photo Story 3, narrate your story and add special effects, transitions, and much more. The new smart touch-up features make it easy to instantly remove red eye, and correct the lighting in your pictures. There are also several different options for saving a story and its associated project so that you can edit the story later or share it immediately. If you have a collection of pictures on an MSN Group Web site, you can import these pictures into your photo stories. The Photo Story software seems to be old or discontinued. If you need more information please contact the developers of Photo Story (Microsoft Corporation), or check out their product website.